Air temperature surrounding the device. A non-profit organization that develops voluntary consensus standards and conformity assessment systems for products, services, processes, systems, and personnel in the United States. Often used incorrectly with respect to illumination as a synonym for luminous flux, an objective measurement of the visible power of a light source. See International Commission on Illumination. Source A light source that emits light only in the direction it is pointed or oriented. The relative light output performance at a temperature compared to the light output at a nominal or test temperature. An electronic circuit that converts input power into a current source – a source in which current remains constant despite fluctuations in voltage. An LED driver protects LEDs from normal voltage fluctuations, overvoltages, and voltage spikes. A complete lighting unit consisting of LED-based light emitting elements and a matched driver together with parts to distribute light, to position and protect the light emitting elements, and to connect the unit to a branch circuit. 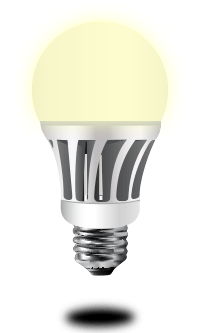 The LED based light emitting elements may take the form of LED packages, (components), LED arrays (modules) LED Light Engine, or LED lamps. The LED luminaire is intended to connect directly to a branch circuit. Organic light-emitting diodes (OLEDs) are based on organic (carbon based) materials. In contrast to LEDs, which are small point sources, OLEDs are made in sheets, which provide a diffuse area light source. OLED technology is developing rapidly and is increasingly used in display applications such as cell phones and PDA screens. However, OLEDs are still some years away from becoming a practical general illumination source. Additional advancements are needed in light output, color, efficiency, cost, and lifetime. The active power divided by the apparent power. See standard deviation of color matching. The property of a material’s ability to conduct heat.